BBA students impressed the panel of judges during the Lazaridis ICE Winter 2019 finals on Friday, Mar. 29. The competition, held twice per year, is a mandatory part of every BBA student’s third year and has been running since 1977. The opportunity to work with a real company on an existing issue makes ICE one of the most anticipated and memorable experiences of the BBA program. Congratulations to all ICE participants, you did it! A special congratulations to this year’s ICE finalist teams, teams 16, 23, 32 and 51, and especially to this year’s winners – Team 16! At the ICE Kick-Off event, the 600 third year BBA students were randomly grouped into 80 ICE teams and given their first assignment. The following day, the excitement was palpable as students anxiously awaited the announcement of the case company: DLL Financial Solutions Partner. Assistant Professor, Meredith Woodwark worked closely with DLL to develop the case question in a way that encompassed all areas of business management – marketing, finance, sustainability, and more. DLL sent representatives to do a Live Q and A session with the students to help them thoroughly understand the issue and the company, and then the teams were off and running. Over the course of the following week, the teams developed their case recommendations, submitted written reports, and created and practiced their presentations. The groups then participated in up to three rounds of presentations, with only four of the original 80 teams presenting in the finals. This year’s finalists presented creative and well-thought-out business plans that highlighted their understanding of the case and the issue at hand, and their ability to think outside of the box to clearly and passionately share their recommendations to their client – DLL Group. Students looked at opportunities through the lens of growing revenue and market share, but also awareness and visibility for a company that had previously worked as a white label platform through independent contractors. Their finance knowledge was also put to the test as the case addressed leasing options for energy efficiency retrofits. Recommendations ranged from entering into the arena and sport stadium market to establishing market partnership relationships with contractors, or even working directly with energy providers. All of the presentations were thoughtful, professional, and well laid out. 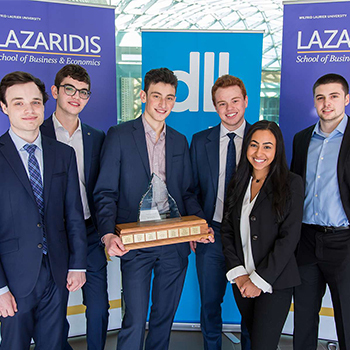 The judges had a difficult deliberation, but returned to name the winning team for Lazaridis ICE Winter 2019 – Team Sweet Sixteen, comprised of Adam Di Iorio, Ryan Gerstein, Aaron Johnston, Adam Rogul, Vivian Shenouda, and Adam Vincent. Their creative new idea, knowledge of existing partnerships, inclusion of new technology, and high-quality presentation earned them the top spot in this year’s competition. “ICE is such a major part of 3rd year and there was so much anticipation leading up to it. I feel lucky to have had such an amazing team and proud to have come out on top,” shared Vivian. “When we first met our team, Ryan joked that we were going to win this thing. Although it was meant to be motivational, it quickly became a major focus for our team and that focus paid off,” added Aaron. We’re still not sure if they consider the win to be a home run or a slam dunk. After the awards ceremony, everyone had a chance to re-group and relax at the ICE reception. The DLL representatives stayed to engage in conversation and continue to connect with students who were happy to celebrate their ICE experience. Students from Team 51 shared how lucky they felt to have established such a great team connection. Many of the teammates didn’t know each other before their ICE assignment and now consider each other great friends. They worked together through the case at hand, through two laptop meltdowns, many Tim Hortons runs, and through countless hours to make it to the finals. “The finals are really fun – this is the day you do this for. I’ve been working on the case since December and I was concerned that the students wouldn’t engage with the content, but they really brought their creativity and passion to it. It was a tough case – it was tough for me – but they rose to the challenge and it was a lot of fun.” Meredith Woodwark, assistant professor and case writer said. The next Lazaridis ICE presented by CIBC will be held this summer, with finals taking place on July 26. Connect with us on Facebook and Twitter to follow the exciting details, or to share your own ICE memories.